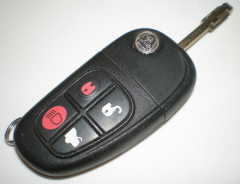 I have decided to write up a very comprehensive article about unlocking all the secrets to the 2001 to 2009 Jaguar Key Fob, how it is made, how to get a key blank and key blank made, how to program the transponder to the car’s ignition as well as how to program the key fob remote button portion to your car, all without the need for a Jaguar Dealer in most cases! This is a very informative article so enjoy and benefit!! !it is applicable to all the following Jaguar Cars and Years as they all share the same key fob. The key blank is a six cut. 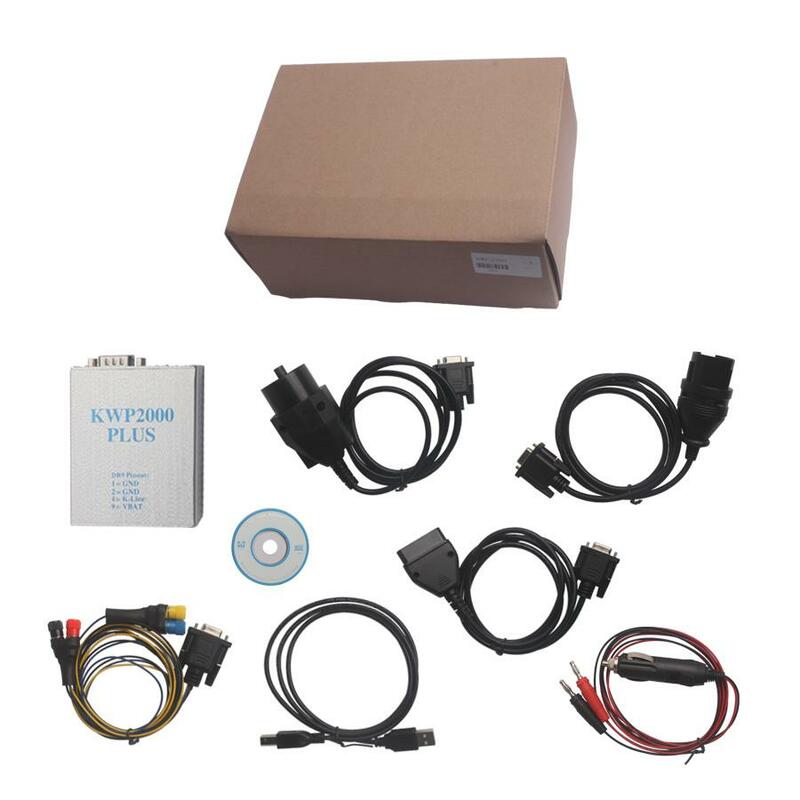 4 button keyless remote entry fob for 2001-2008 JAGUAR X, XJ & S-Type and XJ8 & XJR models that use the switchblade type remotes that transmit on 315.0MHZ with the factory part number 1X43-15K601-?? (for the ?? see the below listing of AB through AJ). 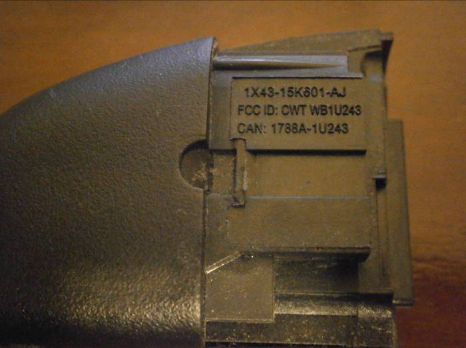 Regarding the like FCC ID NHVWB1U241 or FCC ID NHVWB1U243, the FCC ID is not important as it only means the Key Fob frequency adheres to FCC rules in the US. 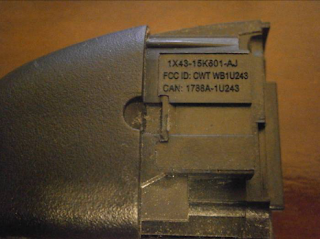 BD – transmit on 433.92MHZ with the factory part number 1X43-15K601-BD which is for UK cars only NOT USA CARS. Upper portion of Key Fob with flip out key blade. 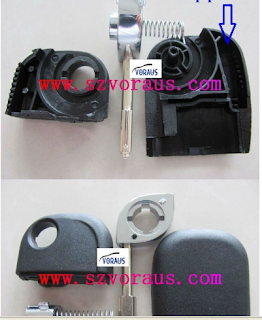 Open upper and lower portion of key Fob. See the Transponder chip in the upper right corner. that tube was removed for illustrative purposes. and this side is placed to point towards the top of the key Fob. 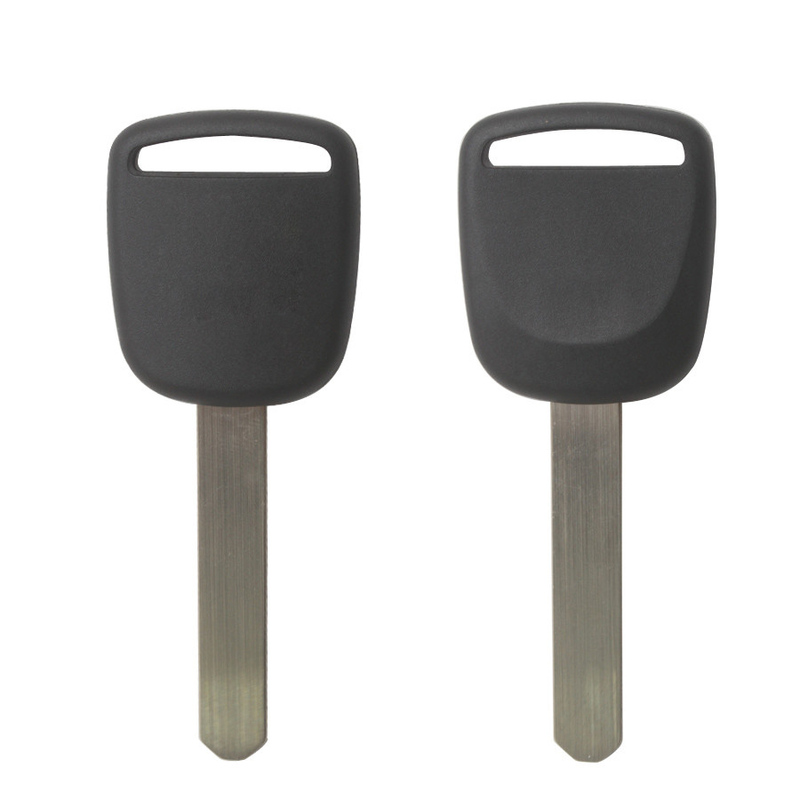 Flip Key Fob Blades, two styles, one is brass, the other metal. are made for your car. Most Jaguar and some Ford dealers can cut the Tibbe type keys from blanks. A Tibbe Key is a near round metal shaft with a flat end where the cuts are made. 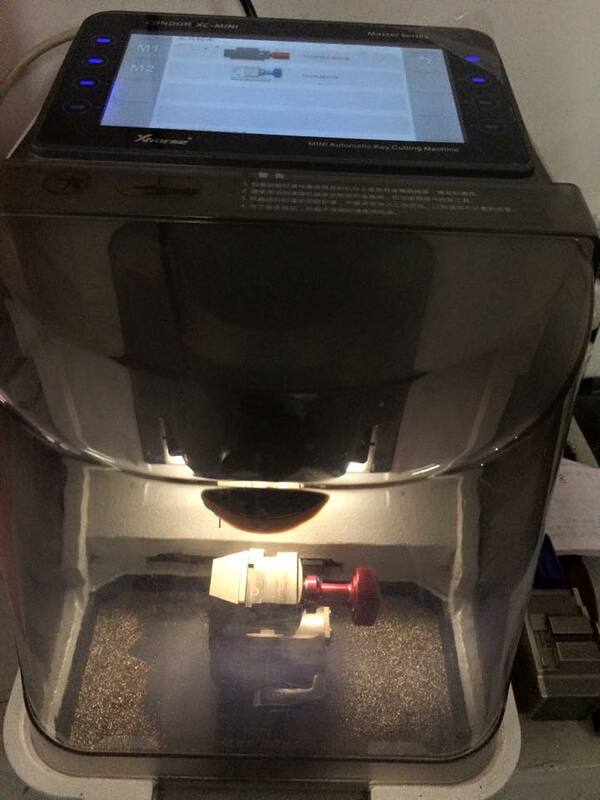 They are exceptionally high-security keys and need a special key cutting machine that costs about $3,100 so not many places are willing in invest in this key cutter due to low demand. This is what the machine looks like. 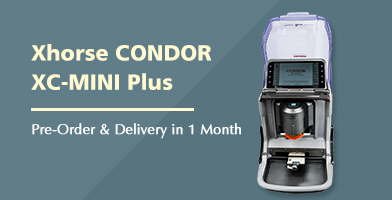 It is a Xhose-made Condor XC-MINI key cutting machine (XC-007 mini version). 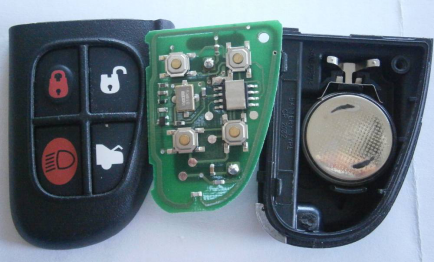 The whole Jaguar key Fob is three parts, the key metal shank, the upper part of the key fob that includes a transponder chip inside the plastic portion which interacts with the immobilizer chip inside the ignition of the car and the lower four button keyless entry remote part. There are 3 things that need to happen. 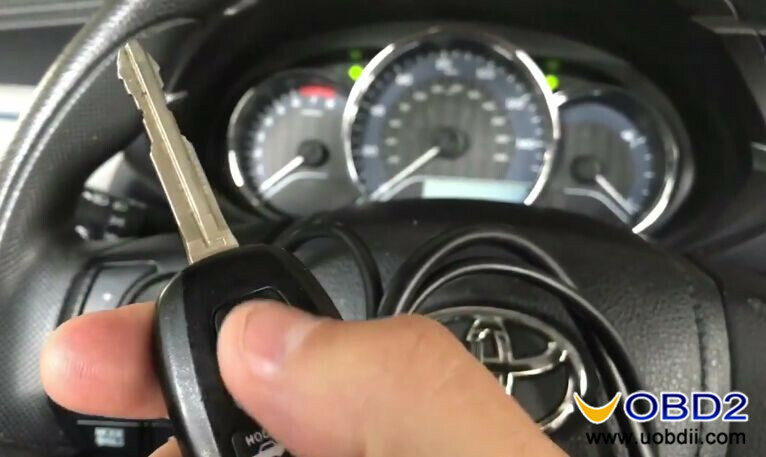 The first thing that has to happen is the key needs to be physically cut to match the car lock by either giving the dealer your original key or providing the dealer the T-Code. The T-Code is the sequence/depth of the six cuts (pre 2001 there are 8 cuts with key blank part being a little longer). 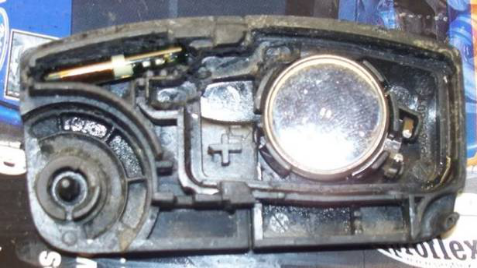 The code was provided new with the car on a vary small plastic or tin plate which typically gets lost or misplaced. Starting from the base of the key shaft and going towards the tip of the key, a key T code may be T124132. A 1 is no cut, a 2 is a slight cut, a 3 is a deeper cut and a 4 is the deepest cut. All keys will usually have at least one level 4 cut. 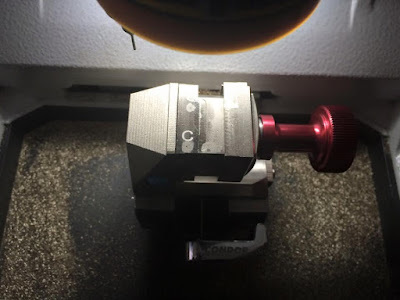 If you open the flip key half way open you will see a very small metal dowel type metal pin, this pin can be pushed out with a small screwdriver or small punch with a little consistent firm pressure. The dowel when pushed through with the flip open half way will just miss the plastic casing of the key fob. Once the metal dowel is removed you can simply wiggle and pull on the metal shank to take it out. 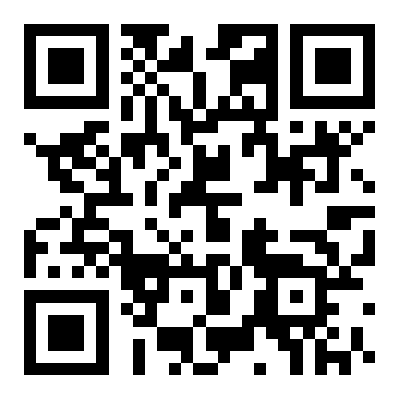 To Illustrate here are two keys which we will determine their six digit T code for. The six cuts are always above the sharp flange and not past it. That is way at the tip of the key you see a flat spot and then the triangle type end. Both sides of the key are cut the same. 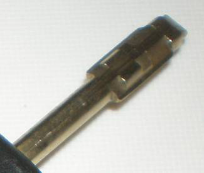 Going from the base of key to tip of key the T code for this key is T421212. Going from the base of key to tip of key the T code for this key is T242113. Notice that a 1 is a no cut and a 4 cut is a cut that is right down to the flange. 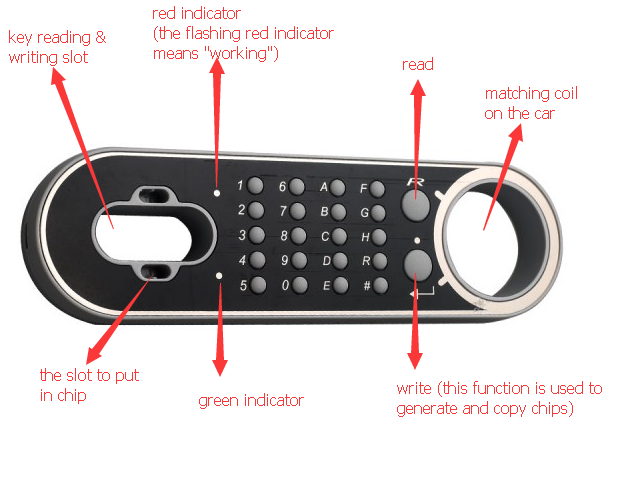 The Second thing that has to happen is the programming of the upper and lower portions of the key fob. There are potentially two programming options here. A do it yourself approach that requires that you have your two original keys (or two working keys) and thus allows you to only add an additional key or up to 3 more additional keys (max 5 keys) OR having the Jaguar Dealer use their IDS system to program all the keys (max 5 keys). 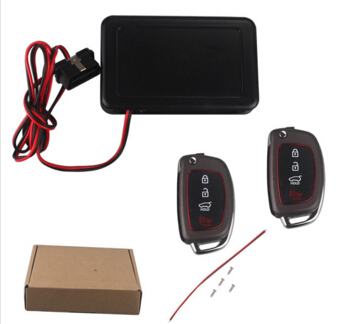 Upper portion of Key Fob Programming of transponder to the cars ignition to be able to start the car. Must have the two original keys. If one is missing will have to reprogram all keys using Dealer WDS/SDD software.• Insert the first valid key and turn to the run position (position II, not position III run engine) for a maximum of five seconds, then turn to off and remove the key. • Within ten seconds of removing the first key, insert the second valid key and turn to the run position for a maximum of five seconds, then turn to off and remove the key. 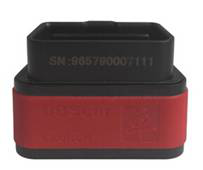 • To program the third (additional/unrecognized) key, insert the new key and turn to the run position within twenty seconds of removing the second key, allow the in car PATS RED LED to prove out for three seconds to confirm storage of the additional key, the red security light will then go out, then turn the key to off and remove the key. • This method can be used to store up to a maximum of 8 ignition keys. Lower portion of Key Fob programming of the four button remote portion. NOTE: When carrying out steps 4 to 6 below, all current transmitters will be erased from memory. Ensure all transmitters to be programmed are available before proceeding. NOTE: If at any stage two chirps are emitted, then an error has occurred, if this is the case, the process has to be repeated from step 1. When carrying out steps 1 to 7, ensure no other transmitters are operated within range of the system (which should not happen if you have all of the key fobs with you in the car and no one else is playing with them). 1. Open driver door (door must be open throughout the programming process). 2. Pull directional indicator stalk to headlight flash position and hold. fourth/fifth time you hear a chirp from the sounder and the PATS Red LED security dome will flash once). At this point all transmitters will be erased from the cars system. The next step will program all of your push button remotes to your car. a mistake mid way as the first transmitter will be erased if you do). 7. Close driver door. 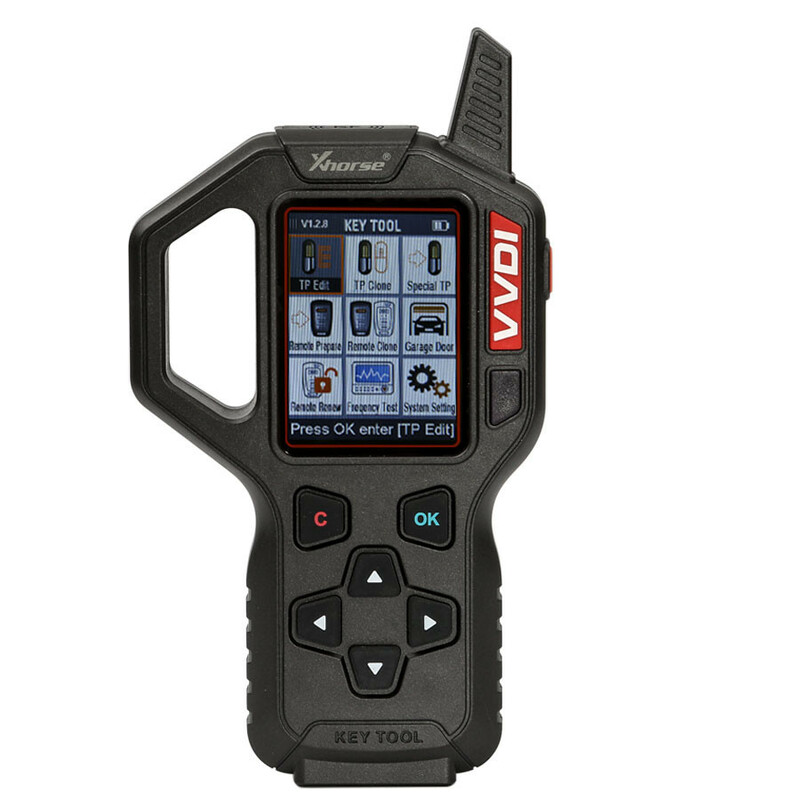 Now check each transmitter’s functions on each of the four buttons on each of your Fobs. procedure is all about the speed, timing and doing it smoothly. The PATS LED is the security dome in the middle of the dash, right up near the front window. If you make a mistake during the process, simply start all over from the beginning. If your car has all audible alarms disabled (as mine does) you won’t get the chirps, you just have to follow the LED flashing. You must flash quickly, then hit a button on one remote, then the other, then turn off the key. I would say it should take 5 seconds or less after releasing the stalk. 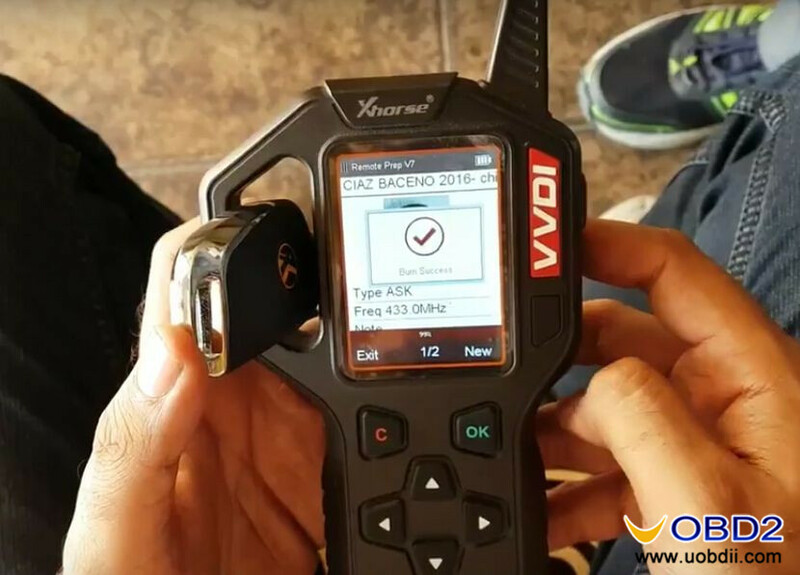 With the Jaguar IDS system ALL keys that will start the car will need to have their transponders programmed to the car at the same time including the “valet” key (which is a regular metal key with a built-in transponder chip that does not have remote buttons/functions) and along with the new key fob. 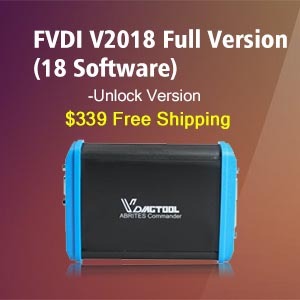 I have found that Dealer prices are all different and also depend if you are having other service being done; they could charge up to $150.00 for programming. Again, remember to bring all keys that you have because like I said if the key isn’t physically present when the programming happens it will no longer work. Basically, what happens is that all keys are erased from the cars computer first and then all keys are programmed, both upper portion of the key with the transponder chip and the lower four button remote part to the car. There is a limit of 5 active keys at any given point in time. As far as I know, pretty much any flip key (XJ8, XJR, S-Type, X-Type are all equal) and will work on 2001-2009 cars as far as the remote. You can order the pieces separately, i.e. Key blades, upper flip part of remote and lower 4 button part of remote. It all just snaps together. Interestingly enough, a tidbit you might not know, is that any of those Jag flip blade keys already cut will LOCK any Jaguar that uses that style key (six cut 2001 – 2009 model year) vs. eight cut (pre 2001 cars) when put into the drivers door lock and turned to lock the door, regardless if the key is for that car or not; but it will not open the door. Some, but very few, locksmiths actually have all the equipment to cut AND program ability – remember you can get Jaguar IDS on the internet if you know where to look. Jaguar IDS will be needed if you only have one original remote. 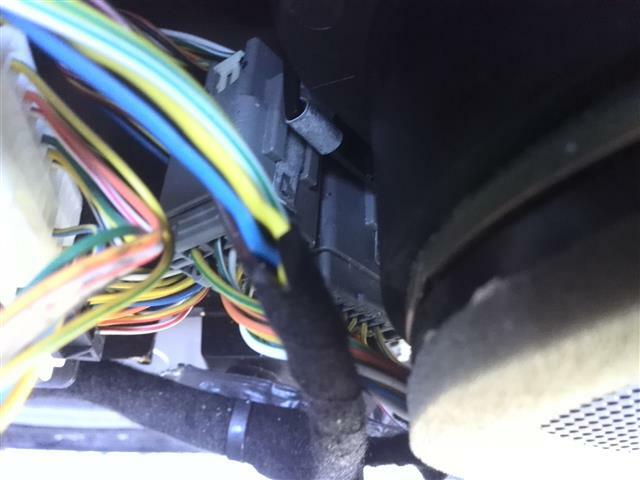 JLR Mangoose SDD cable can test DDM module? 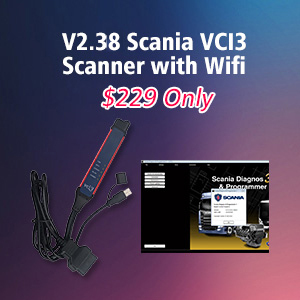 Lauch iCarScan VCI better than Launch X431 iDiag?